In any Ghanaian kitchen or restaurant there will be Shito – a super-spicy black pepper sauce that is virtually essential to any sort of Ghanaian cooking. “Shito” is the word for pepper in the Ga language but has come to refer also to the black pepper sauce itself. Along with peppers, the sauce contain tomatoes, onions, garlic and fish or shrimp paste to give a bit of essential umami. I have seen recipes calling for 30 habanero peppers – so this sauce is definitely not for the faint of heart. Here are a few recipes: from Zoe’s Ghana Kitchen (see below), Homemade by TZ, The African Gourmet, and Nigerian Lazy Chef. You can also buy shito in pre-made form at many African grocers or online. Happy first day of Hanukkah – now it’s time for the treats! We wrote a little bit about the classic Sephardic Jewish dessert fritters, Buñuelos, in the past. However, we underestimated just how popular these little fried dough treats from Spain were. Though they are symbolic Hanukkah dish, and the frying of the dough represents the oil that burned for 8 nights, Buñuelos are also enjoyed as a Christmas treat. Buñuelos, (aka Bimuelos, Burmuelos, among other names) were initially created by Spanish moriscos centuries ago, but have since spread in popularity across Latin America. Kolaczki are woven into Chicago food culture so deeply that it took me a while to realize that they were indeed a “foreign” cookie. 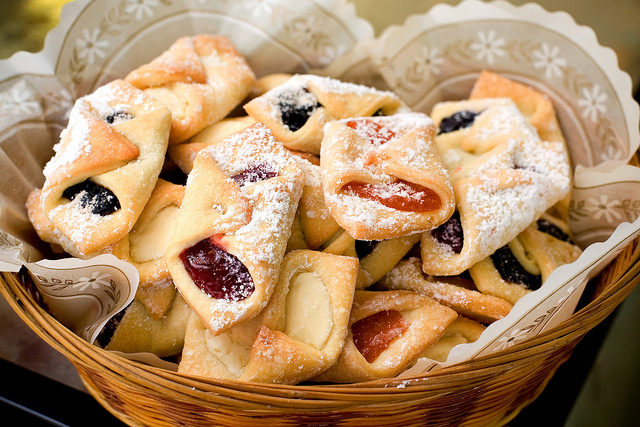 Kolaczki dough is made with cream cheese, and it is traditionally folded (as below) over a filling of fruit – raspberry, plum or apricot usually – or sweetened cream cheese. Originally, the kolaczki is said to be from Poland (though its exact origin is unknown), and are popularly seen around the holidays. They seem to be just as popular in Cleveland, where we learned that they are known as Kiffles in Hungarian. This type of cookie is found throughout Central and Eastern Europe, with several variations, including a circular shape. Even more confusingly, there are many similarly-named desserts, including the Czech kolache, which is more like a yeast roll, and is most popular in Texas (post forthcoming)! Here is a recipe for apricot-filled kolaczki from American Heritage Cooking, another apricot from Cooking the Globe and one for cream cheese from All Recipes. One of our friends is taking a trip through the Baltic countries and put out an open call for recommendations of unique things to do, and foods to try in the area. We must confess that we don’t know that much about Baltic food, but are always eager to learn more. One of the most intriguing and unusual Baltic foods we learned about was Estonian Kama, a flour mixture that is nostalgically revered among Estonians and expats. That’s right – a flour mixture! Kama is made with a mixture of roasted roasted barley, rye, oat and pea flours, and can be eaten as is, since it is pre-cooked. Kama is nonperishable, so it made sense for travel or in lean times. During Soviet rule, Kama was even used in “chocolate” bars as a substitute for the more-expensive cocoa, and this nostalgic candy has actually made a comeback in recent years. Nowadays, kama it is mostly enjoyed as a home-style breakfast, mixed into buttermilk or yogurt and topped with berries. If you can get your hands on some, Nami Nami has a recipe for a dessert mousse using Kama.